CPNs™ can be used in a variety of in vitro imaging applications to maximise the success of your R&D, such as those listed below. This list will expand as more proof-of-concept work is undertaken. If you are unsure if CPNs™ are suitable for a particular application you may have in mind then please get in contact with us. Our Conjugated Polymer Nanoparticle (CPNs™) are ideal fluorescent labels for use in flow cytometry, as their brightness and stability allows for highly sensitive detection of low abundant proteins. CPNs™can be used to detect surface accessible targets in live cells and a full range of targets in fixed and permeabilised cells. The spectra they produce combine well with the standard fluorophores used in flow cytometry and FACS. The CPNs™are non-toxic and do not cause downstream issues for cells after sorting. CPNs™ are readily detectible labels for cell imaging and tracking due to their brightness and stability. The CPNs™ are inherently non-toxic and compatible with continued cell growth in culture. CPNs™ can label targeted cells through endocytotic uptake (including HeLa, HCC70 and PC12 cells) or via linkage to specific targeting moieties, such as antibodies or binding proteins. CPNs™ can be used as fluorescent calibration beads, offering intense and stable fluorescence with a diameter of 0.1μm. The spectra of the CPNs™ work well with the standard filters on microscopes and imaging platforms. CPNs™ are readily linked to proteins, including antibodies, enabling their extensive use in immunohistochemistry and immunocytochemistry. The high intensity of the CPN™ fluorescence facilitates easy detection of low abundance targets and lowers background signals. The fluorescence signal is very stable, which enables prolonged and high intensity imaging protocols, and provides confident long-term storage of labelled samples. CPNs™ have applications in Fluorescent ELISA assays. They produce intense signals that remain stable for over 8 hours, which improves the stability and sensitivity of the assay. The fluorescence of the CPNs™avoids timing issues in the workflow and allows assay plates to be read and re-read after storage. The ELISA can be carried out at 4°C or room temperature and under standard lighting conditions, which is well with laboratory automation. The brightness of the CPNs™ facilitates their use as sensitive labels for probes in Fluorescent In Situ Hybridisation (FISH). The stability of the CPNs™ allows labelled FISH samples to be archived for long periods and analysed at a later date, without further labelling. The CPNs™ can be used to label Western blots, offering enhanced sensitivity compared to enzyme driven luminescence. They offer the further advantage of accurate quantification through the signal being linearly correlated to amount of target proteins present. 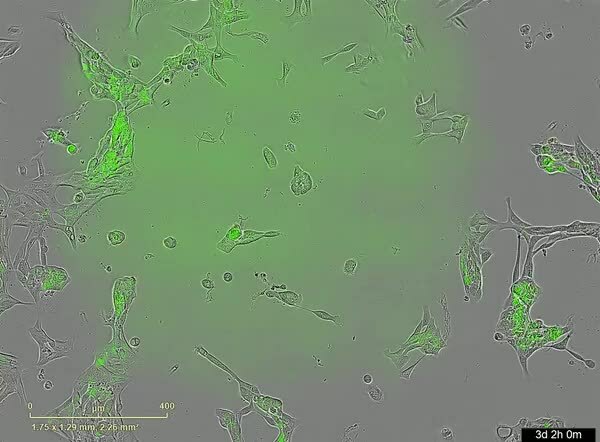 Green CPNs™ taken up by endocytosis in HCC70 cells over 6 days in an inncucyte with no loss of fluorescence. Our CPN™ products retain their fluorescence much longer than existing technologies, whilst remaining chemically and thermally stable.